Laury Gutièrrez led Latin-Baroque Fusion Ensemble Rumbarroco’s “Fiestas & Fandangos from Old Iberia and the New World,” a fusion of Mexican, Guatemalan, Venezuelan and Dominican rhythms mixed with 16-17th century compositions by Diego Ortiz, Santiago de Murcia, Rafael Antonio Castellanos and Antonio Soler at the intimate Gordon Chapel of Old South Church on Sunday. A mysterious Arabic style chant by Daniela Tošic began issued from the back of the church after the captivating entrance of the instrumentalists playing a fusion of 3 different compositions Fandango/Gavan/Fandanguito by Santiago de Murcia (1673-1739). In the middle of the fandango, with the vibrant solos on Venezuelan Cuatro (folk guitar) by Carlos Sulbaràn and bandola by Roberto Pèrez took over the spotlight. Violinist Yi-Li Chang’s approach felt slightly too classically controlled and although technically proficient it lacked the sheer feeling of fandango fiddle. As the ensemble transitioned to Fandanguito, one could hear the combination of Arabic, European and American musical influences in Gutièrrez’ arrangements along with Mexican rhythms and scales. Rumbarroco followed up with an oldest composition in the program by Diego Ortiz (1510-1570). Gutierrez introduced ensemble’s arrangement based on composer’s famous book on the art of improvisation “Trattado de Glosas” where he’s trying to explain how to freely expand one’s musical ideas on various chords progressions. The concept is more tied to jazz style nowadays, but this particular approach has been around with us for hundreds of years. They chose a basic Recercada Primera based on 3 chord harmonic progression and applied a folk rhythm of Merengue Dominicano. (Merengue is a type of music and dance originating in the Dominican Republic, which has become a very popular genre throughout Latin America. In the United States it was first popularized by New York-based groups and bandleaders like Rafael Petiton Guzman, beginning in the 1930s) Luis Celis (bass) performed a contemporary solo in jazz style which was somewhat off-style for this particular piece, but indeed imaginative and very refreshing to audience’s ears. The composition led to a new upbeat tempo followed by Fabiola Mèndez solo on cuatro. Charismatic chromaticisms and solid control of the instrument transferred us to Puerto Rico leaving the listeners pleasantly “jet-lagged” from the variety of styles presented in this arrangement. Cumbees con Currulao by Santiago de Murcia started with enchanting dance groove in 3/4 performed by Carlos Sulbaràn on percussion. 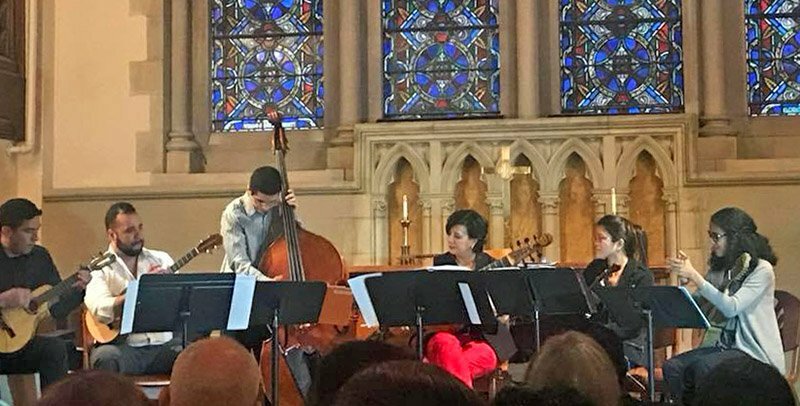 Right in the middle of the piece the arrangement took an interesting turn when the groove suddenly stopped, and Fabiola Mendez began her solo of the original Murcia’s composition for baroque guitar, this time playing beautifully on Puerto Rican cuatro. Her high energy, accuracy and technical proficiency lead us back to the Currulao, a musical genre which references to the folkloric dance of Columbia. Traditionally it is known as old bambuco—a dance oriented towards courtship. Latin-Baroque fusion kept us alert and enthused with an energetic arrangement of Rafael Antonio Castellanos (1725-1791) Vaya de Xacaras con Periquera. I couldn’t help but marvel the rhythmical solidity of Roberto and Carlos which was a backbone of the ensemble throughout the whole concert. They were able to teleport the listeners to the center of Venezuelan music and dance fiesta known as Joropo (Spanish word joropo meant “a party”, but now it has come to mean a type of music and dance that identifies Venezuelans). Another Santiago de Murcia piece Los Ympossibles followed, but this time mixed with a famous Mexican folk song La Lloroncita. Tošic’s vocals captured the essence of the Mexican song with apparent ease of execution. Fabiola Mendez on Puerto Rican cuatro delivered yet again a tasteful and engaging instrumental solo. Throughout, Rumbarroco honored the audience by invoking exploratory mood that invited each listener to create relationships to the music of various cultures, Dominican, Venezuelan, Mexican and others. Finally came the Fandango con Pajarillo by Antonio Soler (1729-1783). A long piece fused with ensemble’s favorite style, Joropo Venezolano started out just like the first piece, with a mysterious tremolo on a single chord followed by fantasy-like improvisation on bandola reminiscing the Arabic oud. The ensemble introduced the fandango chord progression and dived right into the Venezuelan fiesta followed by luminous violin passages, up-lifting castanets and flashy strumming techniques by plucked strings. The fiesta came to a sudden stop and just as the silence before the storm the ensemble started slowly building the atmosphere of a Spanish bullfight where Roberto Perez being a toreador on bandola was pushing and pulling through each phrase as if teasing the bull to its absolute limit. Carlos Sulbaran had an answer on a tiny Venezuelan cuatro, the sheer intensity and control of rasgueado technique allowed the instrument to shine in a way I’ve never heard before. Truly my favorite moment of the whole show which kept my heartbeat rushing as if standing right in front of a bull! The audience went wild demanding for an encore. Rumbarroco complied with Plena by Diana V. Saez which included the listeners, diving them in 2 groups and singing along the composition. This music may be less familiar to the audiences, but it certainly needs more exposure and Gutierrez’s ensemble has done magnificent work in educating the listeners as well as giving us an unforgettable Fandango fiesta. Sunday’s Rumbarroco concert was my second time seeing them, and I can’t begin to describe what a wonderful experience it was both times. I am not a musician, and I don’t know a lot about music history – but the arrangements on Sunday were joyful, and I walked out of the Old South Church simply happy. The musicians clearly love the music and have a blast playing and are so good together. And finally, I really love that Laury comes out to the audience between pieces and gives us in the audience an explanation of what we’re hearing, and why the music that’s been arranged for Rumbarroco is important, where the instruments came from and what they have done to make it their own. I’m grateful that they exist, and I will go see them as often as I can! Sunday’s Rumbarroco concert was a spirited and spirit lifting delight. As one would expect in music-rich Boston, the musicians are all very talented and skilled. They clearly enjoyed and appreciated performing together. The enthusiasm and joy of the audience in receiving the musical offerings was palpable and infectious. I definitely look forward to future programs by Rumbarroco. We discovered Rumbarroco two years ago when they performed for the Cambridge Society for Early Music and became instant fans. So much so that we became volunteers for the ensemble. It was a wonderful concert and we are glad that Boston Intelligencer attended and wrote such a glowing review.